Union leaders have said they could have potential support for strike action - even though only a third of ambulance staff voted in a ballot. Unison officials said turnout was good compared with similar votes. Of those who voted, 80% said they disagreed with West Midlands Ambulance Service. The move follows concerns over plans to close the Shrewsbury and Worcester call centres. Ambulance chiefs have said no decision has been made over the proposals. They include moving the centres to Brierley Hill, in the Black Country, and Stafford. 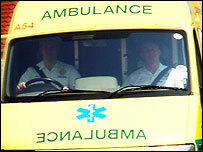 Ambulance leaders have said they want to hear as many people's views as possible before taking a final decision. The consultation period has also been extended from 1 October to the end of November. Unison spokesman Ray Salmon said the 33% of staff who turned out for the ballot was a good response compared to similar votes. He said: "If they do not put things on the table and resolve the problems in the short term, we're going to have to go back to our members and say: 'Well, they have ignored you, what are you prepared to do?'. "Ultimately, that could see some form of action."